As long as you have a Mac that was manufactured in 2011 or later, AirPlay mirroring will work perfectly. But what if you have an older device? For those users, a startup called Squirrels offers an app that successfully mirrors off of older devices. But does it work just as well? It’s incredibly easy to use AirPlay Mirroring with a modern device. With a couple of quick menu selections, you’ll see your Mac monitor on your HDTV in perfect 1920×1080 resolution. If you want to adjust it, you also have that option. According to experts testing the device, it worked very well. The streamed video was sharp and clear, and the frame rate was smooth enough for any type of viewed material. It’s basically a wireless extension of the computer’s display. If you’re running an older device, all you need is to pay Squirrels $10 for a license to their shareware called AirParrot. Download it onto your desktop, and after a simple install you’ll select the AppleTV option for mirroring. You can run AirParrot using Snow Leopard, Lion or Mountain Lion, and it will run on any Mac that is powered by Intel. If you do have significantly older hardware, you might occasionally notice choppy steaming. 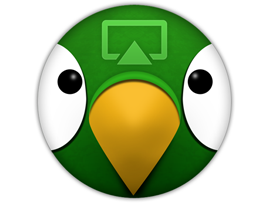 But AirParrot even has a version that runs on Windows, for those users who haven’t yet made the full switch to Apple. AirParrot also has some neat extra features. You can set up your HDTV as an additional monitor for your computer, instead of a straight mirror. You can still adjust the frame rate and resolution, and switch out audio if necessary. The bottom line is, either one is a great option based on your current hardware. Although AirPlay will work more seamlessly and AirParrot will significantly tax your device, either one will fit the bill for your mirroring needs.